PBR - Wins Above Replacement, affectionately known as WAR, is a statistical metric that measures a player’s total contributions to their team in one simple number. Think of WAR as the number you would look at if a key player were injured and a replacement player, either from the minors or the bench, were inserted into their place - it answers the question of how much value (wins) a team would be losing. I won't bore you with the mathematical formula but you can easily find WAR on FanGraphs (fWAR) and Baseball-Reference (rWAR). The metric is league and park neutral, so you can compare WAR figures across years, leagues, and parks. Now that we see the WAR for each of these players, how can we decipher their value on the free agent market? Sky Andrecheck attempted to answer this question with a post a few years back on Rich Lederer's Baseball Analysts Web site - WAR, Salary, and Service: Estimating Dollars Per Win. Andrecheck - and came up with the following equation using figures from 2008 to determine salaries for free agents: 5.53 + (WAR*1.23). 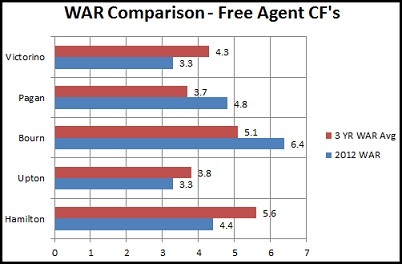 If nothing else we can at least compare the WAR figures to the salaries from Andrecheck's formula and determine the comparative value of the five free agent outfielders included in the chart. Think of it this way, if both Upton and Victorino are going to give the Phillies the same amount of wins over an average player, than isn't Victorino a better option if he can be bought at a significantly cheaper price?